Telemachus begins with "Stately, plump Buck Mulligan" seen through third-person narration that approaches his own subjective position, though the narrative voice is quickly pulled into the orbit of the lean and hungry Stephen. The episode ends with the same person seen entirely through Stephen’s eyes, as a “Usurper” similar to Claudius and Antinous. Mulligan cooperates in this coercive casting by taking the key to the tower from Stephen, which Stephen regards as usurpation because he “paid the rent." In a less literal sense, Stephen may feel usurped because Mulligan would insinuate himself into a position of authority in his life—a life whose credo is evading subjection. In Circe, as Stephen approaches the climax of desperation signaled by his mother's ghoulish appearance from the dead, he cries out against his "foes," one in particular: "Break my spirit, will he?" The "he" remains unspecified, but no one is a tenth as likely as Buck. §  Hugh Kenner observes that Mulligan also usurps Stephen's role in the book: "So ready indeed is Mulligan with quotations, one would think he, not Stephen, was the littérateur in residence. It is he, moreover, who introduces theme after theme. His first words introduce, at six removes, the Jew in exile. His next quotation is from Homer’s Greek. It is he, not Stephen, who intones the song from Yeats that will attend Stephen like a leitmotif. He invokes Swinburne, mocks Wilde, alludes (in a German word) to Nietzsche. . . . Whether playing Christ as he drops his gown . . . or playing the Fool . . . or conjuring up mock-Gothic spooks to make half-drunken medicals roar with delight . . . always on stage, the stately plump Buck in his primrose vest . . . plays parts like a chameleon and plays onlookers like fish (‘Why don’t you play them as I do?’) in roistering affirmation of Mulligan’s Law, the first principle of Dublin, that all is style, is appearances, is show. ‘Usurper,’ breathes Stephen. Mulligan usurps Stephen’s place, stage-centre; usurps, with his mockery, Stephen’s anguished unbelief; usurps, quoting classroom Greek and facile Swinburne, the office of the Hellenising bard" (Ulysses, 36-37). 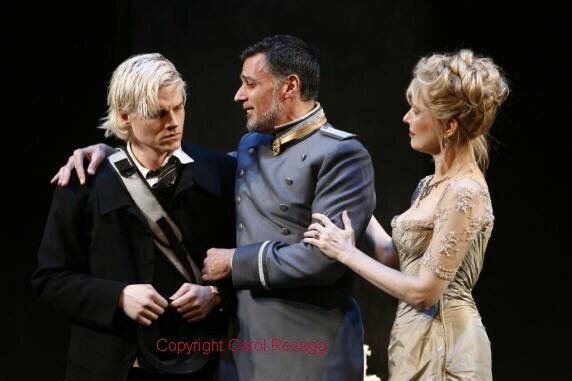 Carol Rosegg's photograph of Hamlet (Jeffrey Carlson), Claudius (Robert Cuccioli), and Gertrude (Janet Zarish) in a 2007 production of Hamlet by the Shakespeare Theatre Company, directed by Michael Kahn. Source: wmhotblog.wordpress.com. Antinous throwing a chair at the disguised Odysseus, by an unknown artist. Source: ww.mlahanas.de.